Isaac Newton first proposed a universal law of gravitation, where every massive body in the universe was attracted to every other one. This simple law proved extremely powerful, able to explain the orbits of planets and the reason the apocryphal apple fell on his head. However, Newton was never able to explain why gravity worked or what exactly it was. 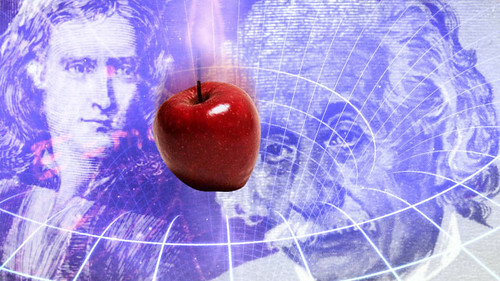 Two hundred plus years later, Albert Einstein was able to offer a more complete description of gravity—one where Newton’s laws are a limited case. According to Einstein, gravity was due to the warpage of spacetime by mass and energy; all objects followed straight paths, just on curved spaces. Read the full story (SPOILER ALERT: it relates to Leonard Susskind‘s “holographic principle,” suggesting in effect that gravity isn’t a fundamental force, but an “entropic” result of information imbalances between the bodies/regions in question) in Ars Technica (recapping Physical Review D, 2011. DOI: 10.1103/PhysRevD.83.021502). 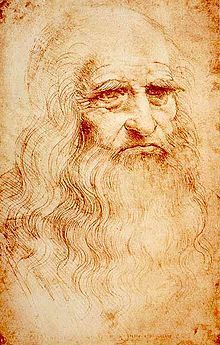 As we sit more confidently beneath apple trees, we might wish a polymathic Happy Birthday to the painter, sculptor, architect, musician, scientist, mathematician, engineer, inventor, anatomist, geologist, cartographer, botanist and writer– the archetypical Renaissance Man– Leonardo da Vinci; he was born on this date in 1452.